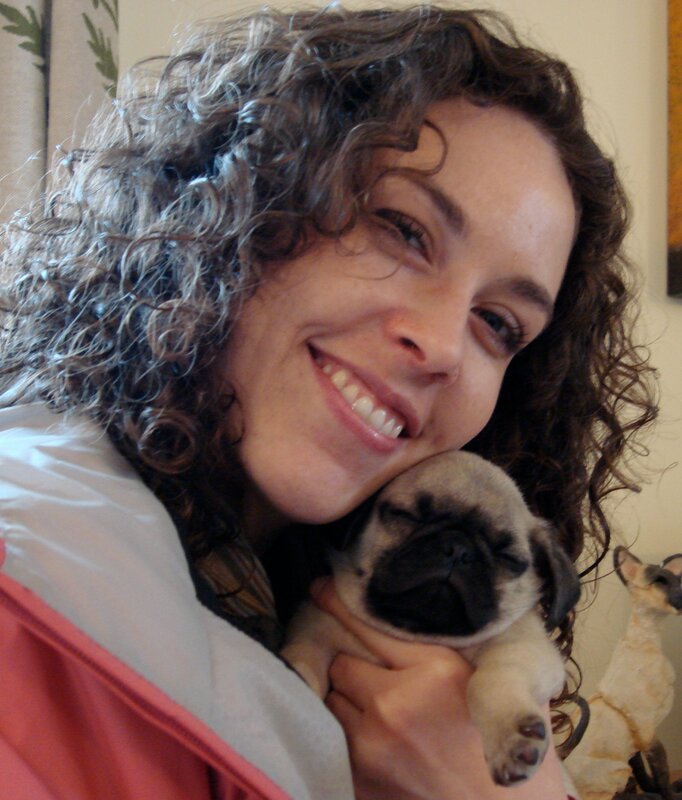 Emily Garman has been building web sites and rescuing dogs since 1997. She is the co-founder of Oklahoma Media Group, a company that provides website development, application programming and mobile app development for companies all over the USA. She is a native of Oklahoma City and has volunteered in animal welfare organizations for the past 15 years. In 2008 she started a blog called TheSocialAnimal.com to help animal welfare advocates learn how to use social media to raise money, recruit volunteers and find homes for more animals. Since then, the site has grown to reach thousands of visitors per month, and Emily has travelled around the world to consult with animal shelters and advocacy groups. Her targeted fundraising campaigns encompass email marketing, social media and traditional media in just the right combination, delivering consistent results upwards of $10,000. She is a regular speaker for the Petfinder.com Adoption Options national tours, and last fall traveled to Riga, Latvia to speak at the International Companion Animal Welfare Conference. National clients include the ASPCA, Humane Society of the United States, PetSmart Charities and Petfinder.com. She was awarded the Advocate in Action Award by the Oklahoma Alliance for Animals for her work in using social media to help pass SB 1712, the Pet Breeder Bill, in 2010.She is available for fundraising consulting as well as website and mobile app development. These are the workshops currently offered by Emily Garman of TheSocialAnimal.com. If you’d like a workshop developed, please contact Emily’s assistant; she’s always looking for new subjects! Interested in booking Emily for your conference or workshop? Let us know. She can tailor these presentations for your audience, or create a new one. Everything changes frequently in social media, and this seminar covers the latest changes on social networks, as well as software and tools that nonprofits need to know about. This seminar will teach you how to harness the tools and concepts of social media to accomplish your goals and help more animals in your program. This session is great for beginners as well as more advanced users, as it focuses on strategies and ways to use social media rather than just technical specifics. You’ll see what other animal welfare organizations are doing to literally raise thousands of dollars a month using social media, and to grow their volunteer and foster bases exponentially. You’ll also learn about exclusive, non-publicized tools and resources available only to nonprofits that can make a huge difference in your online effectiveness. You don’t have to be a technical guru or a Twitter expert to attend this seminar–all you need is an open mind! Social Media for Puppies and Kittens (aka Absolute Beginners! ): How you can tap the Internet to get more donations, recruit more volunteers and save more lives! Learn what social media can and can’t do. We’ll discuss—in VERY elementary terms—what are Facebook, Twitter, Youtube and how each works. Find out what are Facebook personal profiles, fans, groups, and community pages and which kind is best for you and why. Learn how other organizations are using social media to achieve profound results in fundraising, adoptions and more. Learn some very special tools that can save you time and revolutionize your organization’s online effectiveness. A Hands-On Features Tour of this amazing program. Google makes numerous tools and services available to nonprofits for free, and all you have to do is sign up! This workshop is for organizations of any size that are new to the program, or haven’t even signed up yet. Learn what’s available, how to navigate Google’s not-so-user-friendly process to sign up and enroll, and how to utilize each and every service to increase your organization’s visibility, productivity and income! Learn what’s available from this free program, how to sign up and enroll, and how to utilize each and every service to increase your organization’s visibility, productivity and income! (NOTE: this workshop has 2 presenters) Through the Google for nonprofits program, your organization can get up to $10,000 per month in credits for Google AdWords! But managing your Adwords account and campaigns is more than just picking a few keywords and waiting for traffic to roll in. Two AdWords veterans will walk you through the Adwords interface. You’ll learn tricks for creating the best ads, choosing the right placement, bidding secrets, tips for selecting keywords and more. Google Adwords can triple and quadruple traffic to your website–which can mean more donors, more volunteers, more adoptions and lots more visibility. After this workshop, you’ll be ready to get started. What are you waiting for? Stacie Stewart has been in internet marketing since 2000. Her specialties include organic SEO (on page and off page optimization) and channel sales. She’s facilitated successful digital strategy sessions for established companies such as Century Martial Arts, Foundation Surgery Centers and WeGoLook.She currently manages a 3.5 million dollar AdWords budget for an international internet retail company. She is a member of the Google Partner program, having passed exams related to Google Tag Manager and Google Analytics. Emily Garman has worked with Stacie Stewart for the past 7 years, creating marketing strategies for nonprofits, specifically animal welfare organizations of all sizes. She has taught social media at events sponsored by the Humane Society of the United States, Petfinder.com, DogsTrust (UK) and the ASPCA. Social media is an invaluable tool for organizations running campaigns large and small, for fundraising, calls to action and volunteer recruitment. See real-life examples and case studies of campaigns from organizations of all sizes; learn what worked (and what didn’t) and why—and how you can achieve powerful results for YOUR cause through social media like Facebook and Twitter. Many people are embracing WordPress as the best website management platform EVER, for numerous reasons. If you’ve decided to use it, or move your existing site to WordPress, this session will walk you through it. This workshop is for TOTAL beginners. Bring your computers and all your login info! You’ll leave with your blog set up and ready to write. 1Attendees need to bring their computers and all their logins/passwords. We are going to set up their blogs during the session. Internet access is required in the conference room. Understanding the difference (and choosing between) a self-hosted blog and a WordPress.com blog. You’ve uploaded a few videos, gathered some YouTube subscribers – now it’s time to take your YouTube presence to the next level. Based off of YouTube’s new Playbook for Good, this session will walk through content creation strategies (yes, including that golden question – how do I make my video go viral? ), as well as supply information on how to make the most of the new channel design and YouTube’s live streaming functionality. If your YouTube channel needs a jump-start, look no further! Planning is never the most fun part of your success, but it IS the most important. During this interactive session, we’ll go through the entire year and create a marketing plan and strategy for your organization, based on what you want to focus on each month. You’ll leave with a plan and outline of what elements you’ll need to produce for each month’s campaign(s) and how to execute them for maximum results. Your website is the first impression most people have of your organization… And most of our websites don’t make the impression we’d like to make on visitors and prospective donors. Believe it or not, research exists on every single piece of a website that tells you what placement, colors and other strategies will be most effective to achieve your website’s goals. But first you have to know what those goals are! This workshop will walk you through defining goals for your website, the most effective ways to organize your site’s content, and the different cost-effective options you have for managing your site and your data (donors, volunteers, animals, etc.) if you don’t know any HTML. Why do the search engines do what they do? How do they make their decisions? You’ll learn how to choose keywords relevant to your cause and your site that reflect a user’s intent. You’ll also learn about the different kinds of keywords that attract different kinds of audiences: mission-driven keywords for donors vs “calendar” driven keywords for involvement at events. Once you have your streamlined list of keywords, you’ll discover the most important places on your site to put them, boosting your site’s relevancy so the search engines rank you highly for those terms. We’ll look at website architecture and find out if your site’s structure is hampering its ability to rank and what to do about it. Learn about the basics of link building and how to apply the knowledge on your own site. Find out what opportunities exist just for nonprofits that will make your link building job easier. Find out how to build the content that attracts links naturally so you don’t have to spend the time and resources to hunt them down. Onsite learning: For a few attendees who are brave enough to put their sites up in front of the group, we’ll go through as many “live reviews” as time allows to help you see what’s good about your SEO and what you could do better.